You will find many interesting posts, plenty of battle reports, Battle of Finuval Plains being one of the most famous ones. 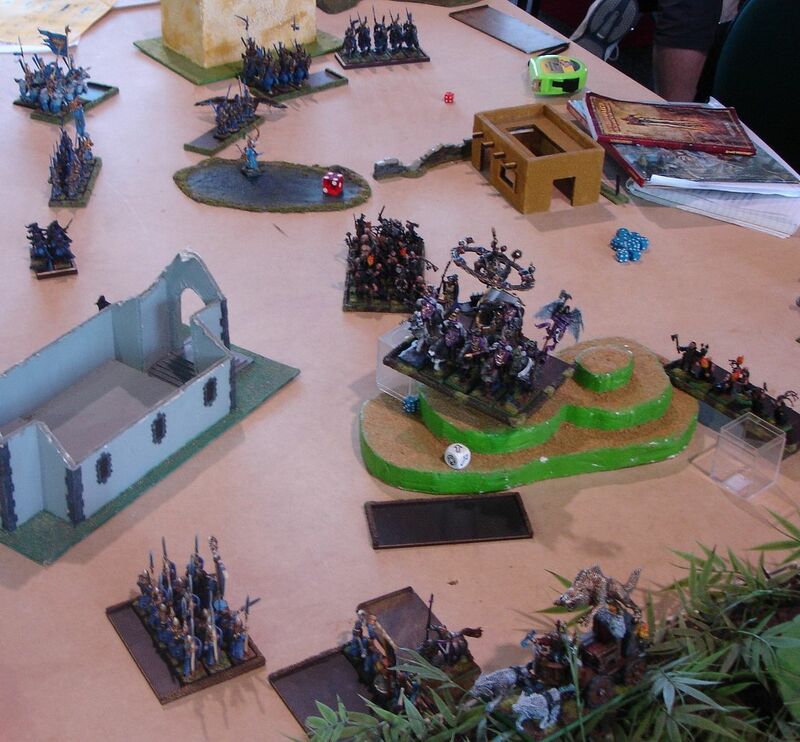 Greg has already posted his report from our game. It was a very rare opportunity to read about the game I played from the point of view of my opponent. Usually, I am very happy if the other player adds some comments about our game. Here is a full report! Check out this link if you want to read it, I highly recommend you do! I decided that from now on, time permitting of course, I will try to have a look at the opponent's army list and simply go unit by unit to assess strength and weaknesses. I think it may help me to visualize how to try and tackle them in the future games and if I came with a good plan to do so in the currently reported one. So, let's see how it goes! On his own he is not a great warrior but he is definitely a great leader as well as very versatile character. For starter he can channel power and dispel dice that is always a nice bonus. He improves the combat abilities of the unit he joins by giving that regiment Hatred. Very useful ability, as who does not like re-rolls to hit! His battle prayers further add to the versatility and can be very handy indeed. However, he is also riding a mighty War Altar that further improves his capabilities. The fact that he is mounted on a large target means his Inspiring Presence is extended to 18", a great thing if you ask me! He also becomes stubborn and has a very good, 4+ ward save. What is more, he confers Hatred to all units in 6" too! Not only he can support a few units at the same time but he can also stay away from danger. The same goes with his prayers, getting better and better! On top of these abilities Arch Lector can use banishment bound spell, a very useful magic missile, good for any occasion. Let's not forget about his Terror causing abilities too! Greg equipped his general with the White Cloak of Ulric. Hm, apparently priests of Ulric and Sigmar are now friends and their past animosities are long forgotten! -1 to hit is a great ability to have and better ward save (2+) against flaming attacks is always good. Hm, he is definitely harder to kill with all these defensive abilities and built in ward saves. He is very mobile and not easy to reach. His stubbornness does not make the job easier. If not for the fact that there are other, more dangerous targets, he could be picked up by magic and shooting. But as he is going to have his entire army between my forces and himself I guess the main thing is not to let him charge (impact hits!) and look for the opportunity to flank charge him and tie him in combat. Quite tanky character and no surprises here. He is a very important for the army so his survival has to be a priority. He is a decent fighter with Sword of Might too. He can fall to Swordmasters/White Lions but it is better to get him via combat resolution. Quite Interesting combination. Light wizard obviously adds to the strength of the Banishment spell with the possibility to obtain can also be great to support the troops. Beast wizard obviously improves the sheer strength/toughness of the knights and he can do it easier thanks to the lore attribute. The chance to eliminate them will lie in the fact that they have to be with the units of knights so if I can engineer good combats I could eliminate the unit and the wizard(s) together. There are 4 units of them and that is tough. The most dangerous of them are Demigryphs as they have the best grinding power, also in subsequent turns of combat. White Wolves with their great weapons come against my army. Human knights strike after Elves so striking is even more important for them. Inner Circle Knights are better defensively but their charge can be devastating too. I have learned that the best way to defeat the knights is to flank charge them. I would definitely try to do so. 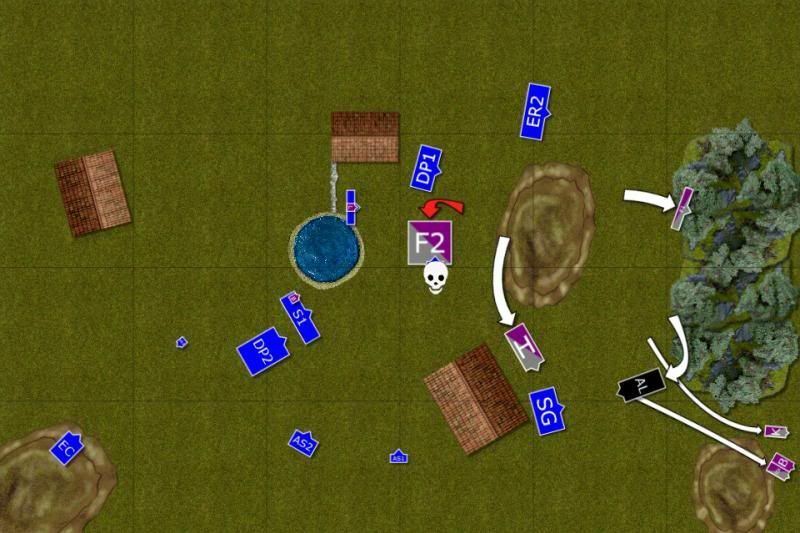 The some casualties inflicted by shooting and magic (Searing Doom!) can also be very helpful. The problem here is that there are so many of them! I needed to find a way to isolate these regiments and try to destroy them one by one. I think I had a chance to do that provided I could slow down/divert the regiments I didn't want to engage at a time and be able to eliminate the one I chose quickly. You don't see many of these guys these days. They can unleash a lot of damage but their new rules mean they also can hurt themselves and their numbers may melt quickly. I guess the choice is: take lots of them or not at all. Greg took 2 units of the crazy fanatics. These guys could actually inflict a lot of damage in the first round of combat and that was a dangerous prospect for my small units. In order to defeat them I wanted to use bow shooting first, to make their numbers manageable and then finish off in close combat where my archers and sea guard can actually do a lot of damage too. I also wanted to use the fact they would struggle to keep up the pace with the knights to my advantage. Another very useful model in the army. Chariots are always dangerous against my small units and this one helps a lot in combat too. Having +1 to hit with possible re-rolls due to hatred from Arc Lector can turn dangerous units of knights into combat monsters. It has relatively low armour, however, and once in combat can struggle to inflict damage. All in all a fast and combat orientated army. Good thing it didn't include a steam tank (always a challenge to contain) or hellblasters. Not so good that it is very fast and very well protected. But I was sure it will move forwards as it needs to be in combat in order to win battles! * Prologue and Epilogue by Master Storyteller, Il Maestro! The sound of steel horseshoes striking the paved roads filled Larry’s ears and made his head ache. He was not quite sure how long he had lapsed in and out of consciousness for, but he knew that every moment was a moment too long. Though he was closer to his prize with every step they took, so were his enemies. Enough time has been wasted, he thought as he sat himself up in the makeshift carriage carting him along, and waved over one of the soldiers. The words came out more as a croak then a command, but the warrior nodded and left all the same. Larry looked out past the column of soldiers behind him to the fields on either side. Rolling plains of brown and red grass stretched to the right of the outcasts, and on the left was a small river, not nearly large enough to support any settlements. The land as a whole was alien to him: every blade of grass was slightly different than those he was used to, the colours were not as brilliant as they should be, even the wind smelled stale and wrong. But it was also somehow familiar. He couldn’t quite put his finger on it – it looked nothing like what he saw in the visions, and yet he knew he was on the right track. I thought the same of that damned forest. The thought cut through his reverie like a hot knife through butter as his eyes drifted to the right, past the rolling plains and to the retreating red forest that lay at its edge. The home of his twisted kin. He felt a sharp stabbing pain in his leg at the sight of those red leaves. A remnant of my death. he mused, the gods’ way of reminding me of my failure. The thought soured in his mind, but his brooding was cut short by a familiar face. ‘Good to see you up again, even if you look like you’ve sucked on a skin of lemons,’ Bob shouted as he heeled his horse around and fell into line next to the carriage. ‘Learning from your past ensures you don't repeat your mistakes in the future.’ The soldier sent for the waterskin returned and Larry grabbed it and popped the cork off, taking a big gulp as Bob chuckled to himself. ‘And what exactly have you learnt, oh wise loremaster? Were you working out how to take revenge on trees and leaves?’ Bob watched as Larry emptied the rest of the waterskin as if he had never had water before. Bob’s face reverted to stone as his smile faded away. ‘Tell me more.’ Bob leaned in to listen intently to every word the loremaster uttered. ‘You are not the only one who hears those howls.’ Bob spoke as he waved a command at the column to halt. He leaned forward in his saddle, making himself low against the horizon, as he looked past Larry’s shoulder and off into the distance ahead of the column. A lone rider appeared over the next hill, galloping towards them as fast as his mount would take him, purple cloak fluttering behind in the wind. As he made his way down the hill and towards the column, a wolf appeared behind him. It was larger than any wolf Larry had ever seen, muscles bulging as it howled and bore down on its prey. The distance between the wolf and the rider was closing fast, and it was clear that neither would make it anywhere near the Asur lines. Bob leaned to his right and unlatched his bow from his saddle. He pulled a white-fletched arrow from the quiver hanging off his bridle and knocked it in a single fluid motion, taking aim. The wolf closed in on the rider as the pair reached the bottom of the hill, snapping at the horses rear as it lunged forward. Bob held the arrow for what seemed an eternity, moving ever so slightly as he honed in on his target. A sudden snap pierced the silence as the arrow was let loose and sailed through the air. The rider had turned in his saddle to try and ward off the giant predator, sword hand held high as the wolf made a final lunge forward. The leap was cut short by a flash of brown and white as Bob’s arrow pierced the wolfs eye, sending the large beast headfirst into the ground, twitching. The rider turned back in his saddle and made his way back to the column unharmed, greeted by the cheers of the watching Asur. Bob casually lowered his bow and reattached it to his saddle, calling out orders to the column to prepare for battle. He turned to Larry and smiled. 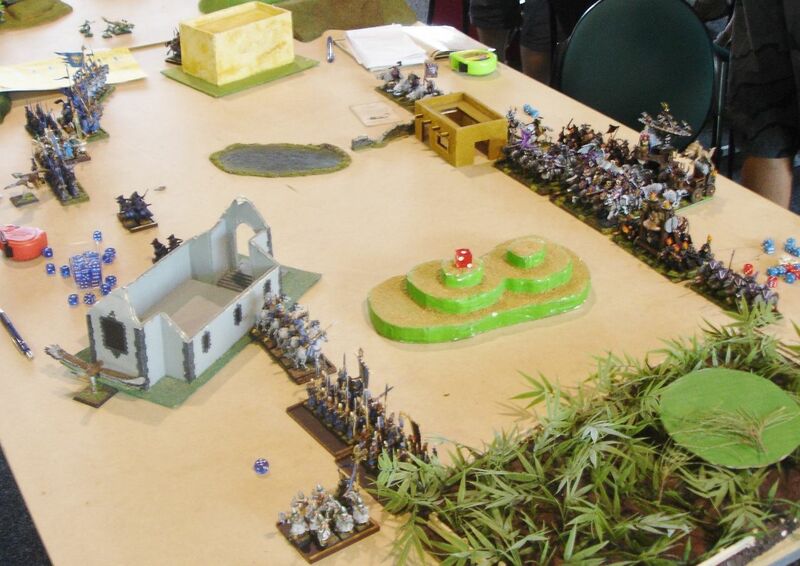 Armies arrayed for battle - but have you seen the size of that forest? 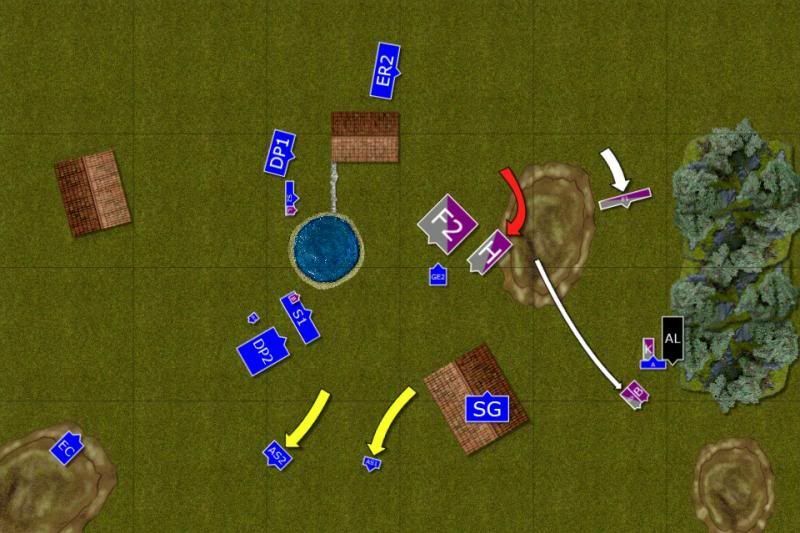 Greg decided to play with refused flank formation and set up his steel steam roller on my right flank. I decided I need more time to manoeuver and wanted to use the opportunity that the Demigryphs were a little bit isolated already and put almost all my combat units on the left flank. 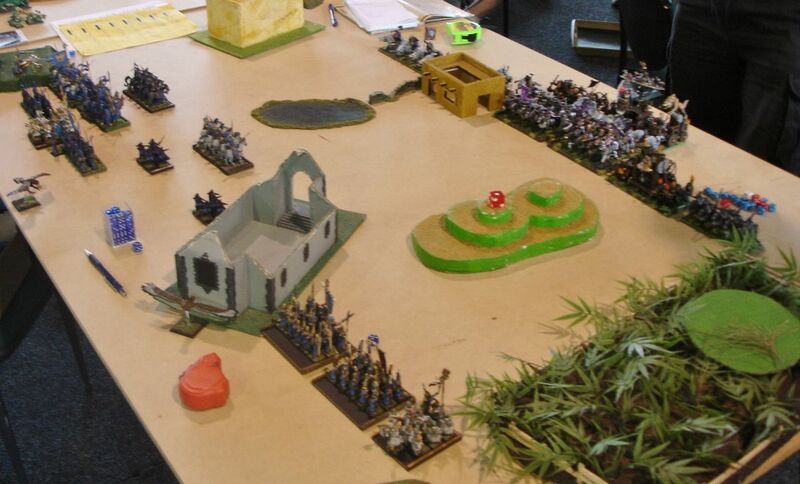 That would give me the opportunity to approach Demigyphs fast and force the other knights to choose, either chase infantry on the right or turn towards the centre and face my assault teams. 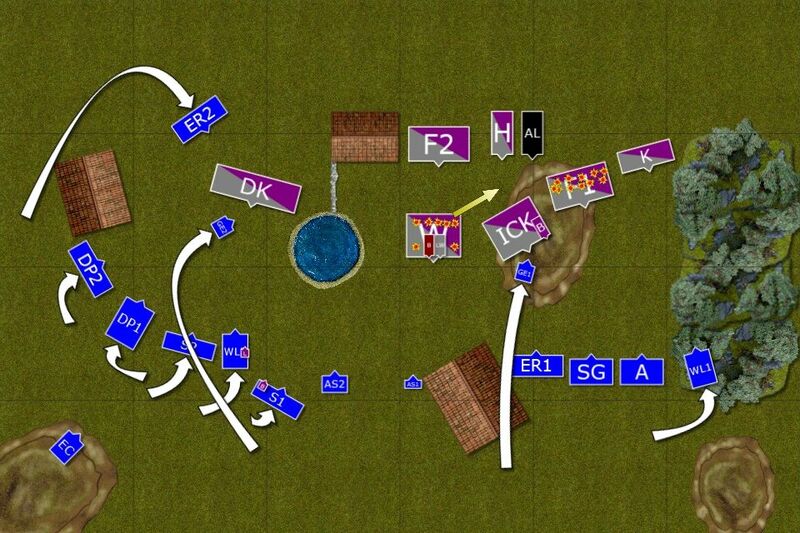 I left Archers and Sea Guard on the right flank so that they could fight against fanatics. On the other flank there was nothing they could attack. I added a unit of White Lions for some hitting power against small unit of knights. And the forest could help them too. Surprisingly, I won the roll off and had the first turn! High Elves seized the initiative but moved carefully. The Knights might look cumbersome but if that steam roller picks up the momentum, there will be no time to react. Better be ready before that happens. Due to long range for arrows not many of them find the true mark. Only Sisters of Avelorn managed to pick the weak spots in the full plate armour of the White Wolves in front of them. Arch Lector didn't even stop reciting litanies of hate while the whole armoured might of the Empire rolled forward. Only Demigryph Knights, charged with protecting the flank of advancing regiments, didn't move at full pace. Flagellants prophesied doom lauder and lauder and then somebody shouted "Burn the Witch!". Arch Lector, seeing that the crowd of the fanatics are willing to disperse, decided to do exactly so and cast a spell that burned a few Sisters of Avelorn. Flagellants howled their approval. Setting up the trap - Wolf Hunt begins! The power of the Elven Archery! 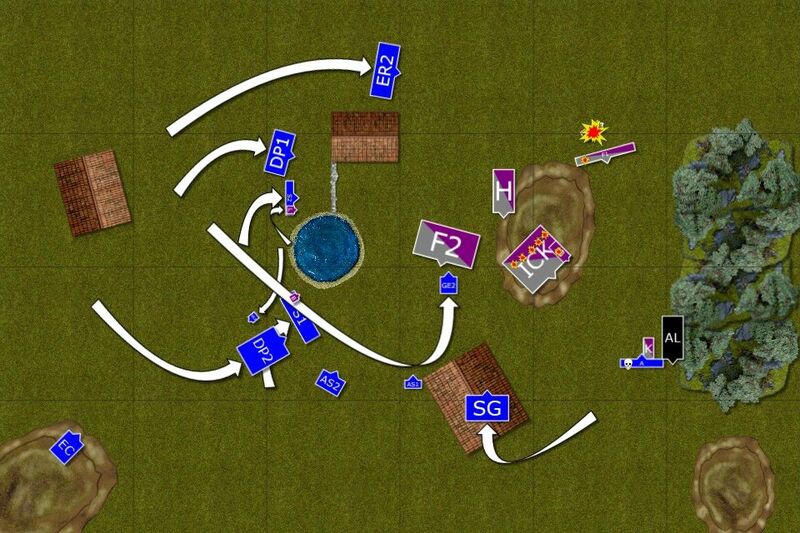 The regiments on the left flank moved to positions in order to set up the trap on Demigryphs. In the meantime, the Elven shooters show a display of archery that is devastatingly accurate. First, a combined effort of Eagle Claw crew, Bob's skills and Sister's abilities sees all but one White Wolf Knights remaining in his saddle. The wizards that accompany him didn't wait any longer and simply fled towards the safety of their own lines. Encouraged by that success, Archers and Sea Guards aimed at the fanatics on the hill and inflicted horrendous casualties. 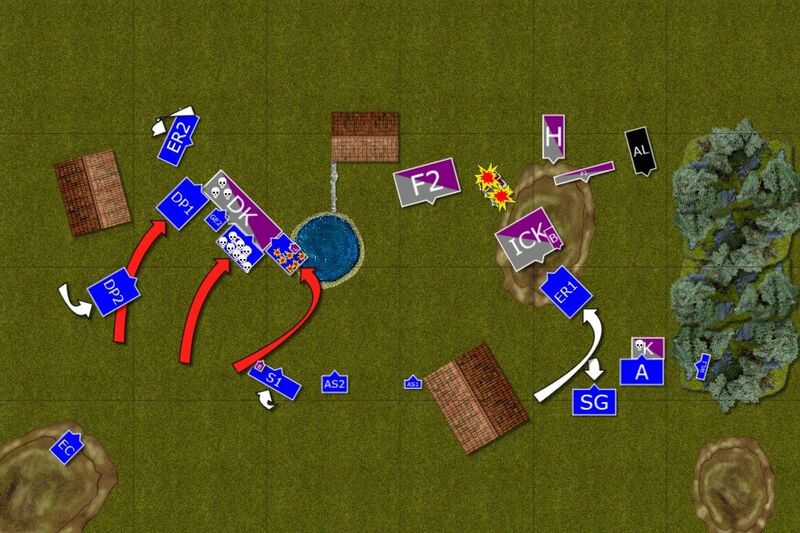 Two enemy units were rendered useless in a blink of an eye! Demigryph Knights charge the obvious bait but even aided by the Speed of Light they are not able to bring the great eagle down. Or was it planned? Inner Circle Knights charge the second Eagle and show how it is done. 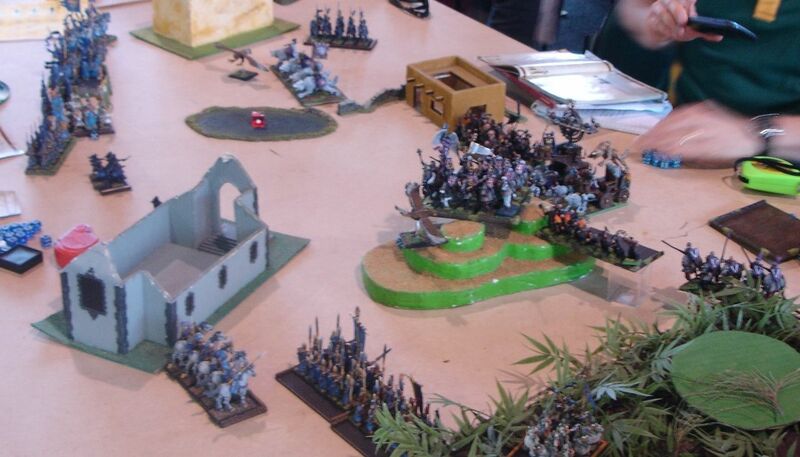 Even small unit of Knights charge the Archers if only to save the flagellants. However, they lose one of their numbers due to treacherous forest and another one by the Elves themselves! Arch Lector, infuriated by the fact the advance of his army was slowed down to a crawl channels his fury into a powerful spell and White Lions, being the target of his hatred, lose more than half of their numbers. Brave Chracians refuse to give ground though! 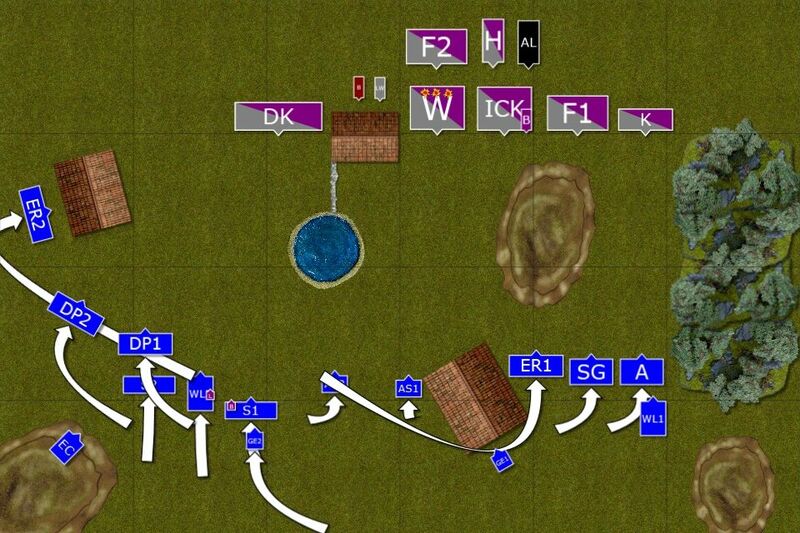 Western Flank - full out attack! As one Elven units charged against Demigryphs. Dragon Princes expertly avoided impaling the great eagle locked in combat with ferocious beasts. 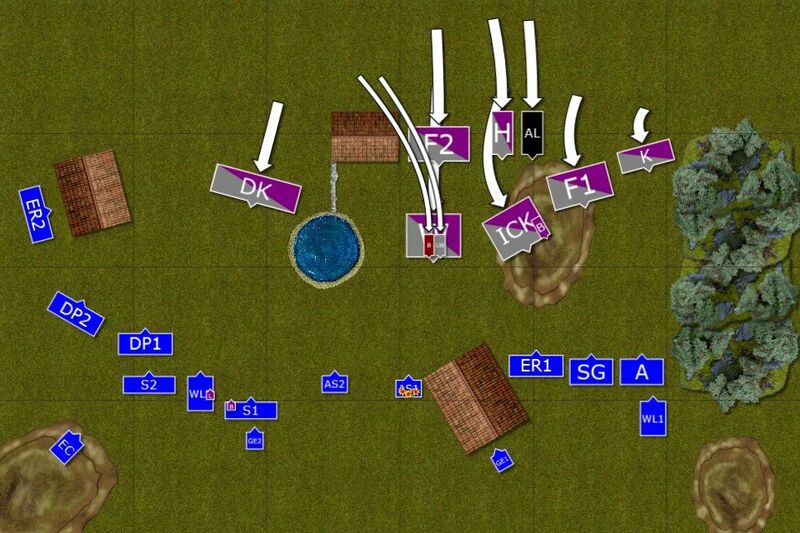 Swordmasters stormed through the middle while White Lions, ignoring boiling torrent, charge the flank. However, Demigryphs still being under the influence of a spell, are faster even than Elves. Swordmasters die in droves before they have a chance to strike. The blows from Lions and Princes are deflected and only single beast is put down. What is more, the fury of magical water claims the lives of almost all the White Lions. Elves are shocked but their centuries old training and martial prowess keeps them in combat. Seeing that such perfectly engineered attack is stopped by the timely assistance of wizards, Bob orders the shooters to aim at the enemy mages. 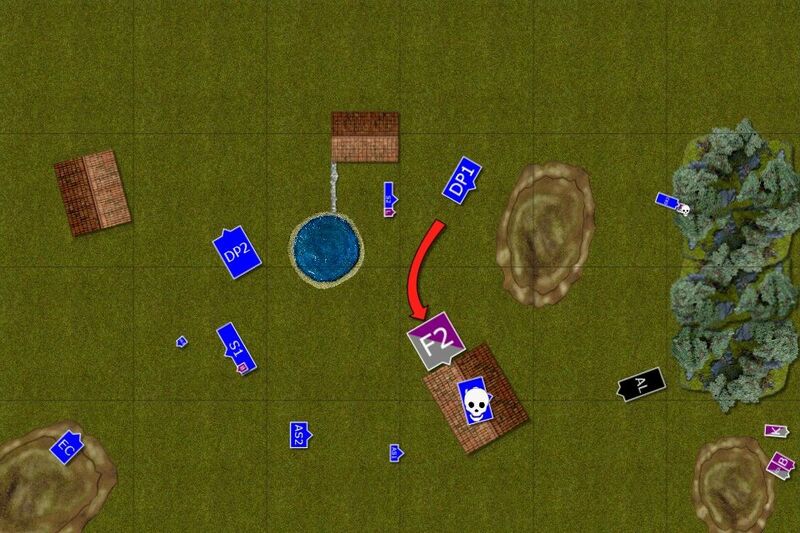 With no knights around to hide behind, both imperial spell casters are soon dead. Single White Wolf knight is all that remained from that proud regiment. For now. Without the aid of the wizards, Demighryphs were way slower and this time their armour proved to be no protection against expert strikes of elven blades. The most powerful regiment of the Empire was no more. Inner Circle Knights suffered some casualties on their way and destroyed yet another annoying light regiment of the enemy. Even Arch Lector joined the fight! He drove through the treacherous forest, protected by his faith, finished White Lions and slammed into nearby Archers. But they held the line nevertheless! I swear there was a unit of the Knights on the hill just a moment ago! 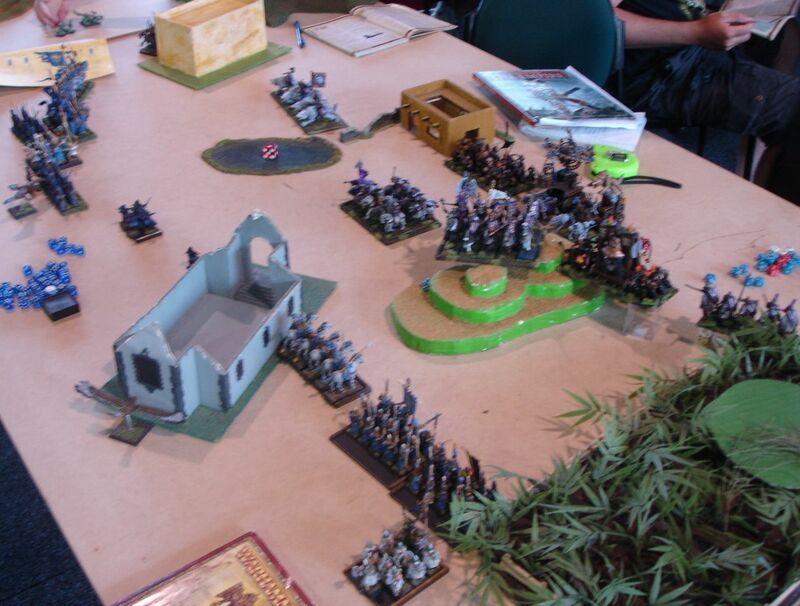 Elven regiments manoeuvred to close in with the imperial regiments still on the battle field. Larry the Loremaster spotted fleeing knight of the White Wolf and send some warm farewell after him in the form of a fireball. White Wolf screamed with joy and ... disappeared! Then the Eagle Claw crew spotted a perfect target. Inner Circle Knights exposed their flank for a perfect shot. A single bolt sailed through the air and slammed into the first knight unhorsing him in a heart beat. Then second followed his companion, and third and fourth! And the bolt kept going only to stick in the side of the Imperial BSB who managed to stay in the saddle. Barely! Imperial BSB and his sidekick moved at a double towards the safety of the nearby hill hoping no more arrows will be sent towards their way. 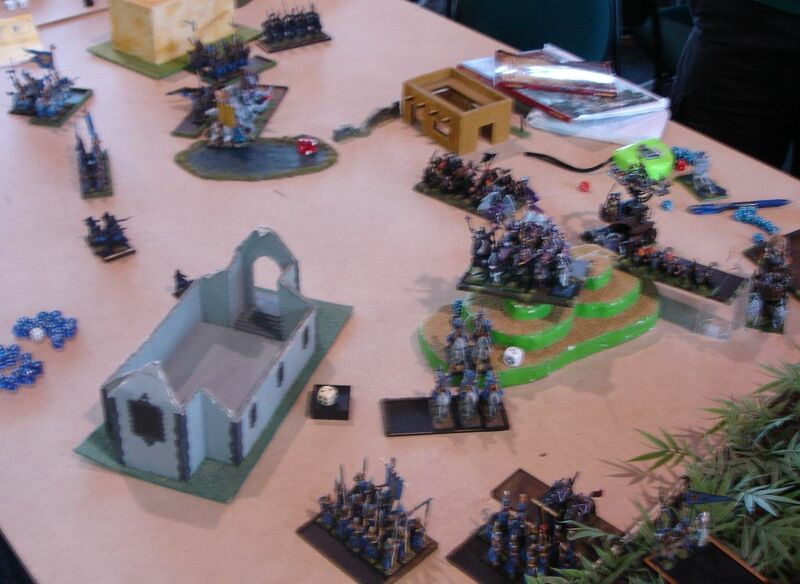 Another knight (the only one that was left from the regiment that fought elven Archres) and Arch Lector were still locked in combat. Hurricanum crew tried to catch Sisters of Avelorn but they were greviously offended by such primitive attempts to win their affection and simply turned around walked away, deeply insulted. Elven units, although exhausted, keep pressing hard. Reavers chased down flagellants who were heading towards the forest. Hurricanum was damaged too. 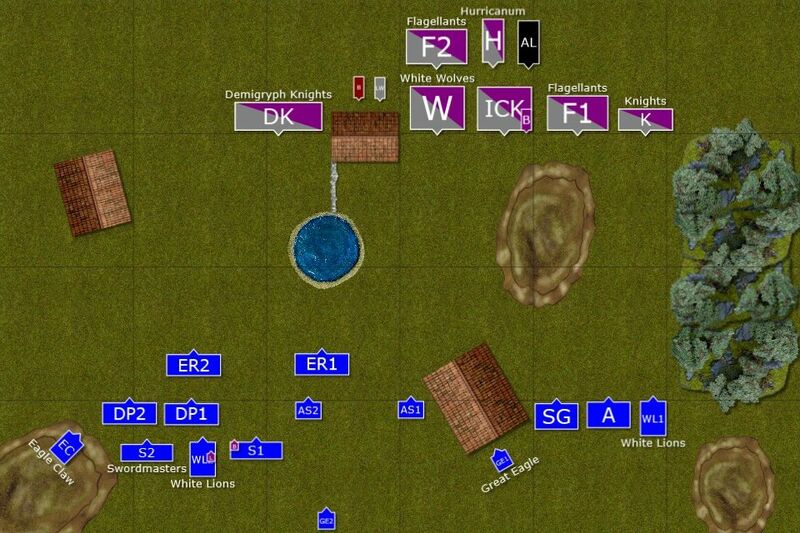 Unfortunately, Sea Guard could not find the weak spot in the armour of the fleeing knights. Only Flagellants remain to fight! 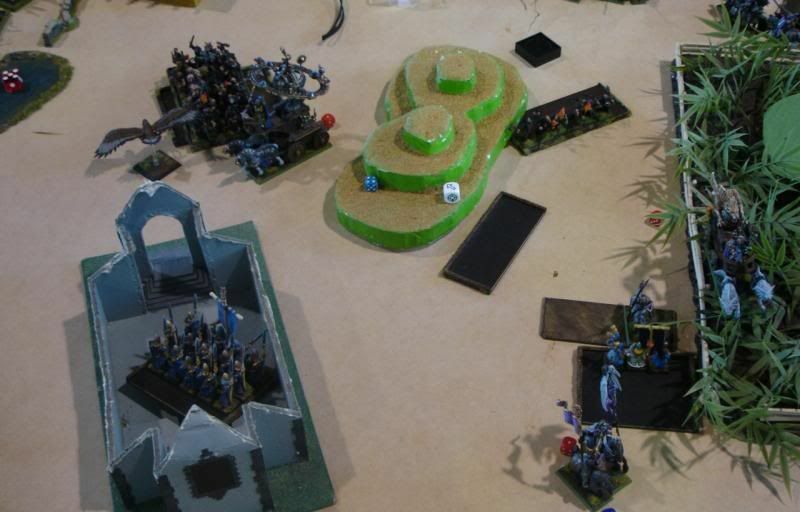 The knights keep fleeing behind the hill while Arch Lector and Hurricanum threaten Sea Guard. Flagellants finally hunt down the eagle but are surrounded by the Elven units. 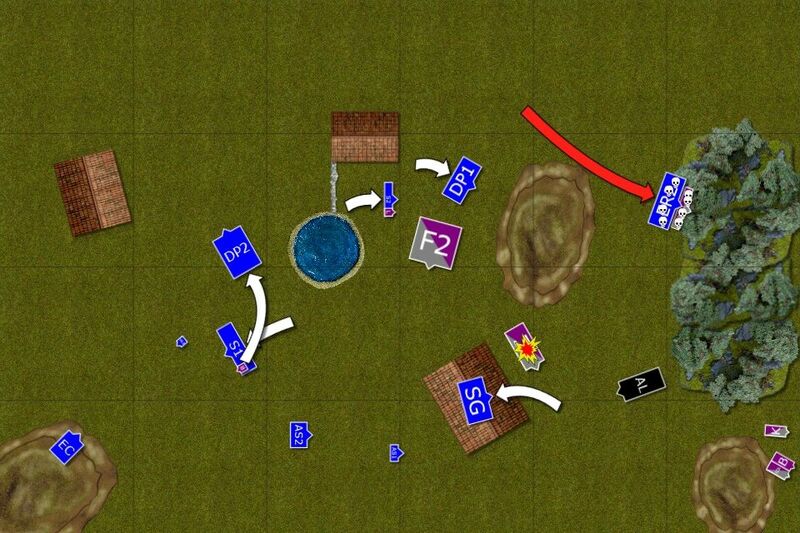 Elves didn't decide to charge lone Flagellants and moved away from the danger instead. Sea Guard hid in the nearby building. Reavers charged fleeing fanatics and vicious combat erupted where Falgellants killed as many of their foes as themselves! Only a single survivor remained from each regiment and none gave ground! Finally, Larry the Loremaster, deciding it is appropriate from to say farewell with a bang, cast yet another fireball, this time dismantling hurricanum. Elves relaxed a little bit too early and now it was time to pay for that. Flagellants spotted movement in the seemingly abandoned church and stormed in! No heretic will soil the holy ground with his presence! 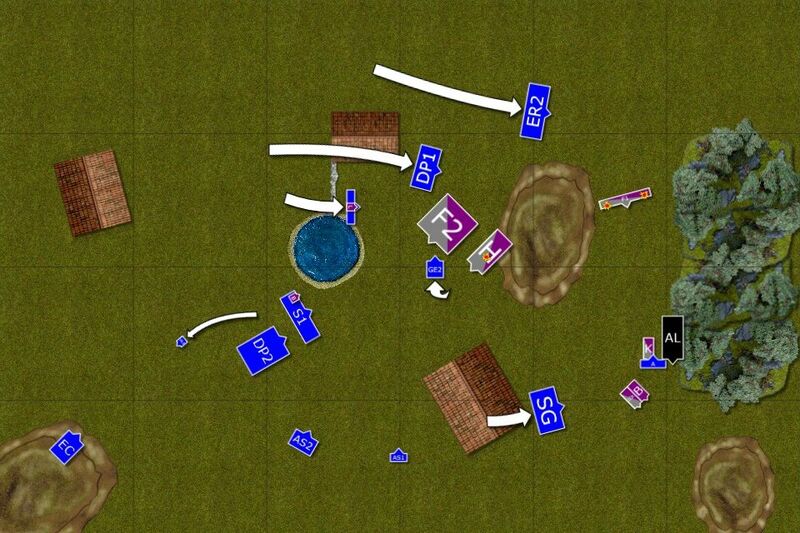 Sea Guard fought bravely but they were not able to withstand the fury of flagellants and died to en elf! As a revenge, last reaver finished the last member of anther group of fanatics. 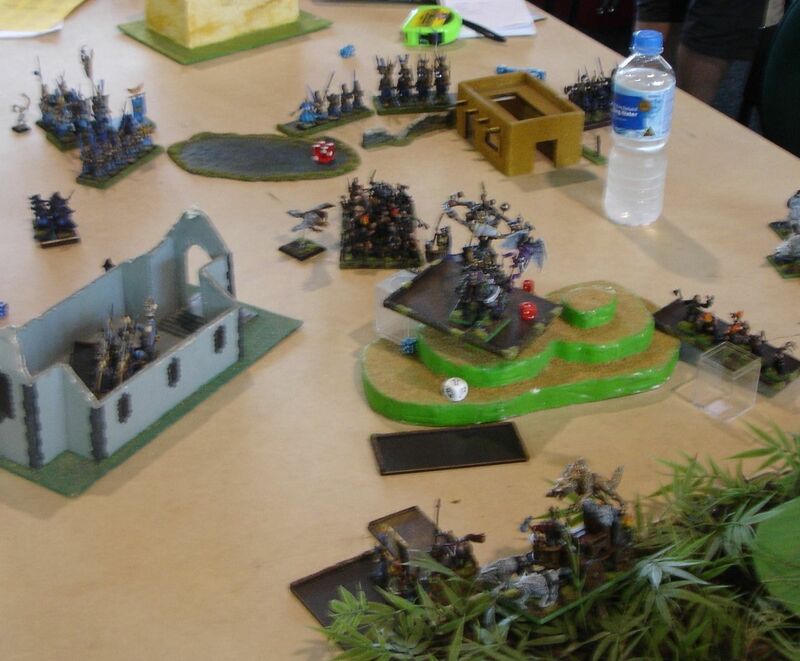 Both armies were bloodied and now disengaged but it looked like Elves gained hard fought advantage! Larry floated inches above the corpses as he made his way to his prize. The stench of the dead wolves and humans hardly rendering, his mind’s eye solely focused on the danger ahead. As he approached the wreckage of the shrine, he paused in mid-air. His heightened senses could feel something, though he couldn’t quite put his finger on it. As his mind probed the pile of rubble in front of him, he felt a sudden shock reverberate through his senses, giving him the briefest of moments to put up a magical barrier as the wreckage in front of him exploded outwards. As the debris ricocheted clear of his magical defences, Larry spotted a lone figure standing in the midst of the now dispersed war altar. Holding hammers of pure golden light in each hand, the robed man lifted his eyes and caught the gaze of the Asur mage. He held Larry’s gaze for a few moments before spitting on the ground in disgust. ‘Your treachery ends here!’ the priest bellowed in his primitive human tongue. Larry scoffed and let his body drop until his feet touched the ground, the magical barrier dissipating as he did. Larry’s mind was focused on keeping his face still and free from the doubts raging inside him. Does this pathetic little creature really know what I’m looking for? Is his false god guiding his hand? Have the gods abandoned me already!? Larry pushed the last thought aside and strode forward, his sword held low preparing to strike. The warrior priest crossed his hammers in front of his body and mumbled a short prayer before rushing forward himself, the two meeting in a titanic clatter in between. Golden hammers flashed against the blue sword as each warrior parried, riposted and struck, trying to find the opening that would give them the edge. Larry could feel a bead of sweat roll down his brow as his sword flicked to and fro, barely keeping pace with the whirling hammers. Gods he’s fast! he thought as he ducked under a wild swing and came up on the other side of the swirling priest. He lunged forward to strike at the priest’s exposed back, but the human continued rotating and his hammer came around and knocked the blade tip aside. Over reaching and off balance, Larry could do nothing about the second hammer except watch as it came around and clattered into his standing knee, shattering the bones underneath in a spray of light and blood. He crumpled to the ground, the blue blade disappearing as he fell down, clutching his leg. Pain seared through Larry’s mind as he searched for the correct incantations to heal his wound, but the thought was cut short as a shadow fell across his vision. He turned his gaze skyward and saw the warrior priest standing over him, hammers emitting bright light as they hung by his side. The priest smirked through his large beard and lifted one hammer across his body, preparing for the final blow. ‘Sigmar showed me this moment, Asur. May the light of our father consume your unholy soul.’ The priests eyes lit ablaze with holy fire as be tensed every muscle in his body and swung the hammer, sending it on its final arc towards Larry’s exposed head. Light flashed and the world spun as Larry was knocked to the ground, his head hitting the dirt with a hard thump. He lay there for a moment, sight slowly returning to his eyes as the bright light faded, until he was able to see the feet of the priest standing before him. His head still swimming, Larry slowly lifted his body off the ground and sat up. I should be dead he thought to himself, trying not to empty his stomach over his good knee as he tried to focus on the warrior priest in front of him. The blur of his eyes slowly cleared as they focused on the face of the warrior priest, and a gasp passed his lips. The priest stood mid swing, frozen in his final act of execution. A scorched lightning pattern marked the priests skin where none was before, and wisps of smoke began to rise from his clothes. The priest’s beard was all but gone, leaving only seared flesh underneath. Larry’s eyes met the priest’s, the burning blaze therein now reduced to a small kindle that finally winked out. As it did, the twin golden hammers disappeared, and all that was left was the smoking ruin of the corpse. His thought was cut short as he spotted a small object amidst the ash. He slowly inched himself forwards until he was close enough to reach it, his hand brushing aside the cremated remains and closing around a small stone object. He brought the object close to his face and examined it. It was a little cube, no bigger than a ring, with embossed runes on each of its faces. They were simple in design, not the elegant work of an elf, and Larry turned it over in his hand as he studied each side. Finally he stopped at the last image on the cube, and stared at the embossed depiction of a face. I liked it also because there was a lot of action of different type. Combat, magic, shooting, every phase of the game was nicely represented. In the end I pulled out [b]12-8[/b] victory but a few different dice rolls and things could have changed. 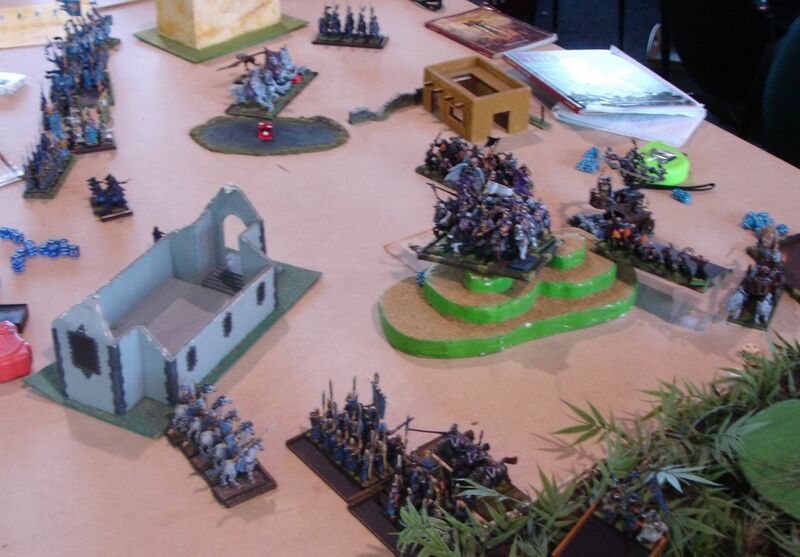 I was very pleased with the result though, as armoured fist of the Empire is not that easy match up for Elves. Let's go through some more details then! As always I am wondering about the deployment. In general it worked fine but I feel I haven't used the building well. Maybe I should have put Sea Guard or Archers there in my first round? It was good defensive position. Alternatively, a unit of Swordmasters always makes for a good garrison and I could have put more pressure on the Knights by just being there. I definitely made a mistake with White Lions on the right flank. I should have moved them better, in the way that allowed counter charge immediately after small knights attacked archers. It would have either stopped them from charging or would have destroyed the knights early. The shooting went very well through out the game. S4 against nominal 2+ armour can be very useful too! 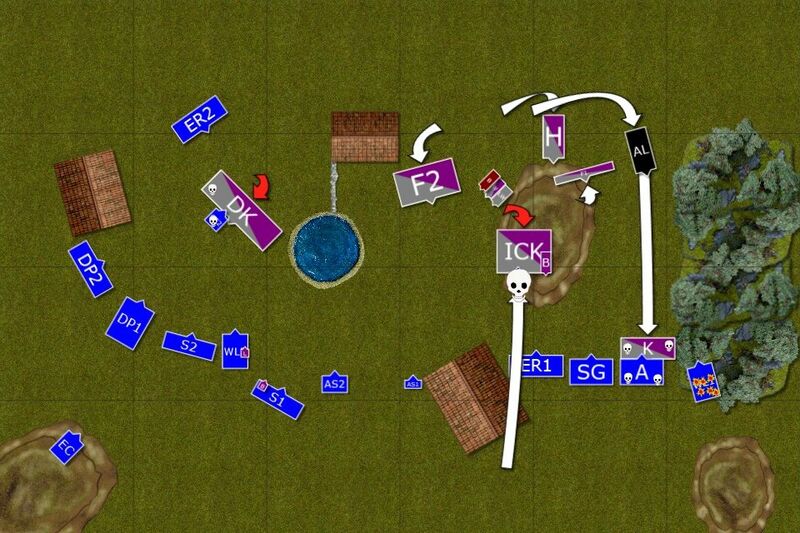 As always, even a single casualty for regiments of cavalry is a problem. I am glad it was so efficient. A pity I didn't have a little bit more luck to roll 3+ for number of wounds on BSB with that single bolt! Although that shot was amazing anyway! And then a little bit more luck was needed to get these single knights and/or BSB. The combat against Demigryphs was very interesting. I had to choose which spell to let go as I didn't have enough dice to dispel both. Somehow I chose Wildform and now I know it was a mistake. Sure, T5 demigryphs are more difficult to wound but as it was shown, hitting first is more important. Not to mention the fact that I ended up with Lions in boiling water and then proceeded to destroy my own regiment. Fortunately, I saved the last member! I am not sure why I didn't charge Flagellants. I could do so with 2 units of Knights and small Swordmasters and Larry. Yes, they have a lot of attacks but I think I should have charged anyway. I had a chance to kill many of them before they could strike. I could also try and add fresh unit of Swordmasters and make it 4 units charge. I thought I was over that indecisiveness but it seems I am not. Ah well, the lesson learned and re-learned. 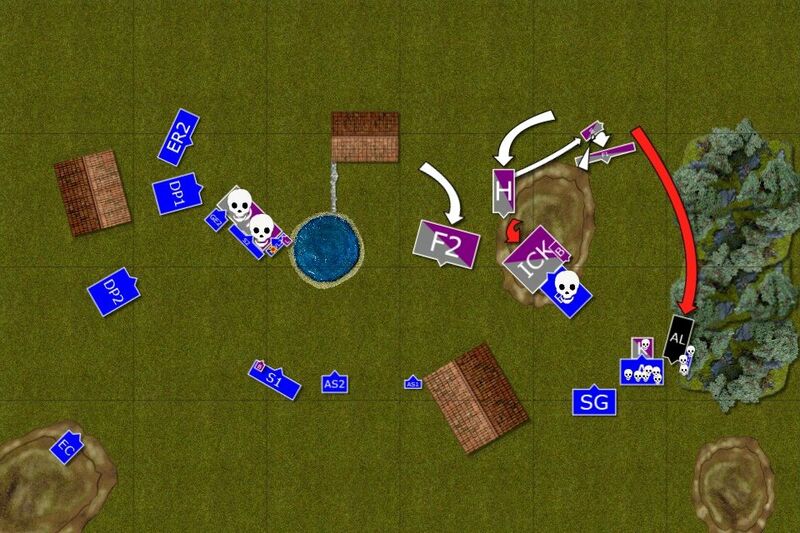 Instead of pinning them down and maybe even destroying them in 2 rounds of combat I lost Sea Guard. Bad decision in the last turns of the game. Fortunately for me it didn't cost me the victory.